Some of the best high-power planetary eyepieces that were ever made by JSO, Pentax, Vixen, Zeiss, and others were ortho and monocentric designs that only came in the smaller .965 barrel size. Many of the superior research-grade eyepieces designed for double star and planetary viewing came in the smaller .965 barrels as well. As the industry of Telescope manufacturing over recent years seemed to settle in on the standard size of most telescope eyepieces to be 1.25 inch it leaves a "VOID" for an adapter so people can use the smaller .965 eyepieces and accessories in the newer standard 1.25" (1-1/4") diagonals and/or focusers. Just about anyone who has been enjoying astronomy for a length of time, for that matter, anyone new to the hobby that may have purchased a good used scope at a yard sale or swap meet might find the need for this adapter. What this adapter does is simple. 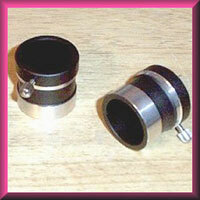 It allows a person to use the smaller .965 eyepieces and accessories in any scope that has a 1.25 inch focuser or diagonal. Some just get one to put directly into the focuser, some people get a set so they can position the .965 eyepieces in the adapter and make them para-focal. Machined from aluminum with a standard thumbscrew to hold the .965 eyepiece in place, and fits any standard 1.25" focuser, diagonal, etc. Don't let those perfectly good .965 eyepieces go to waste because they don't fit, when all you need is this simple adapter to make them work in any modern scope that uses 1.25 inch eyepieces and accessories. Here is a multi purpose item just about every astronomer has needed at one time or another. It is basically a 1.25" extension tube, about 2-1/2" long, but with the addition of having T-threads at the top so you can also use it with a camera adapter. The "T-thread" is a standard in the industry and from that there are countless adapters available for just about every camera ever made that use the common T-thread to mount it to your telescope. What this adapter does is simple. It allows a person to use eyepieces and accessories without the use of a diagonal so your eyepiece or camera can be mounted directly to the focuser. Can be used with any 1.25" scope. Don't let those great old eyepieces or that old-school 35mm or CCD camera that require additional focus travel go to waste when all you need is this simple adapter to make them work in any modern scope that uses 1.25" eyepieces and accessories. 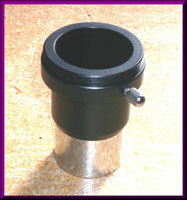 Here is an item for the Do-It-Yourself astronomer that wants to make a giant finder or guide-scope and save money. It is no secret that just about every finder ever made uses the same objective lens as a good pair of binoculars. Here at Russell Optics & Machine, we are no different. Our giant finders use the same high quality cemented achromats and tapered tubes used in some of the most popular binocular available by Orion, Celestron, Meade, and Parks, just to name a few. We buy the lenses and tubes new from the manufacturer to make our finders and would like to offer them to anyone who wants to get their hands dirty, designing and building a project they can be proud of. 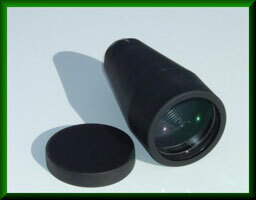 We offer these 60mm f/3.8 (228mm f/l) to those astronomers. You can make your own giant finder, a spotting scope, or build your own guide scope from any materials you may have access to. People have successfully made finders using PVC pipe, aluminum tubing, and even cardboard, adding salvaged parts like used eyepieces, diagonals, and old cross-hairs from finders you no longer use, to build them. The only limit is your imagination. This is a fully multi-coated achromat, tapered rubber-armored tube, objective cap, and 1.47" 18tpi threaded end to build from.